Charles John Hall, a waterman, and his wife, Annie Maria, lived at 1, Clare Street, St Mary Lode, Gloucester, where they brought up seven sons, all of whom played rugby for Gloucester. Nobby, the eldest, enjoyed the most distinguished rugby career of the seven brothers. 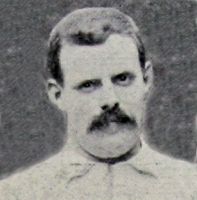 He first played for Gloucester in 1893-4. He was a courageous forward, renowned for being especially good at dropping on the ball, and for stopping dangerous rushes. He produced a golden moment when he scored the try, which Percy Stout converted, to beat Llanelly 5-3 in the 1896-7 season, this victory ending Llanelly’s unbeaten record. His talents were widely recognised, and he made 35 appearances for the County. 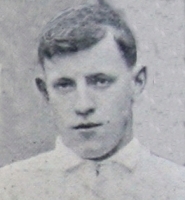 In 1900-01, Nobby played in 3 England trials – for the Rest of the South v London and the Varsities, and then twice for the South v the North – as a result of which he earned 2 international caps, playing for England v Ireland at Lansdowne Road, and v Scotland at Blackheath. The following season he again appeared for the Rest of the South and for the South in trials, but failed to earn another cap. 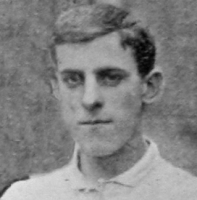 However, in that 1901-02 season, Nobby, described as a sterling forward, captained the County team in their first championship final against Durham (which was lost 3-9 in a quagmire at Kingsholm). Altogether he made 35 appearances for Gloucestershire. During his playing career he worked as a lighterman at the docks, but later became a licensee, first at the Railway Inn, Southgate Street, and then the Market House, Eastgate Street. Of his six brothers, Albert, George, Ernest, Willie and Jim all gained their club caps and the other, Harry, a stylish wing three-quarter, would undoubtedly have joined them but for the fact that his employment only enabled him to play occasionally. Like their eldest brother (Charles), Albert, George, Ernest and Willie all played for Gloucestershire. 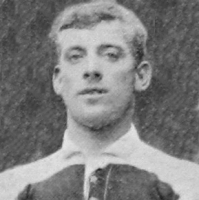 Willie Hall was one of Gloucester’s best players before he left the City for Coventry, later to join the Oldham Rugby League club for whom he rendered brilliant service. His ability was well appreciated in the North of England, and he had the honour of being selected for two Australian tours. Mr. Charles Hall, of the Plough Inn, Sutton Courtney, Abingdon, the former England, Gloucestershire and Gloucester Rugby forward, died at Radcliffe Hospital, Oxford, where he had been lying dangerously ill for several days, on Tuesday. Mr. Hall, who was in his 71st year, was the eldest of the seven sons of the late Mr. and Mrs. Charles Hall, of Gloucester, all of whom played for the City Club – a remarkable family record. 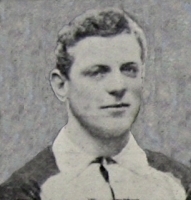 “Charlie,” as he was popularly known among Rugby fans, first played for Gloucester under J. Hanman’s captaincy in 1893-4. In the first year of Walter Taylor’s captaincy in 1896-7 he figured prominently in a great performance when Llanelly lost a much cherished record at Kingsholm. Charlie scored a try for Gloucester, which Percy Stout converted, and the City won by 5 points to 3. 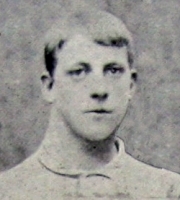 Charlie was one of the best of forwards, and in 1901 gained international honours. He made 35 appearances in the County side. After his marriage Mr. Hall, then a lighterman at the docks, became licensee in turn of the Railway Inn, Southgate-street, and of the Market House, Eastgate-street. From the latter house he went to Sharpness as mine host at the Sharpness Hotel, where he remained for over 30 years before removing to Sutton Courtney. While at Sharpness he maintained his association with the docks and assisted in stevedore operations. Of Mr. Hall’s six brothers, two, George (half-back) and Harry (forward), died within a year of each other about eight years ago. The surviving brothers are Albert (half-back), Ernest (threequarter), Jim (forward), and Willie (threequarter and half-back). With the exception of Harry and Jim, all the brothers have played for the county, Albert being the only one of the five not to be awarded his county cap. On at least one occasion three of the brothers – Charlie, George and Albert – were in the City side together. The occasion was an away fixture with Leicester. It will be recalled that George and Willie joined the Northern Union, the former going to Hull and the latter to Oldham. Like Charlie, Albert and Ernest, they rendered splendid service to the City Club. Most of the playing careers of Harry and Jim were with the Second XV. Albert is the only one of the four surviving brothers continuing to live in Gloucester, Ernest being at Coventry, Willie at Morecombe, and Jim at Leamington. Of the three sisters, Mrs. Dean and Mrs. Gough live in Gloucester, and Mrs. Breeze at Shrewsbury. Mr. Hall leaves a widow and three children. Two sons are serving with H.M. Forces overseas. Charles, Albert, George, Ernest and William all played for the County. William and Ernest both also played for Coventry, and William then joined Oldham and was selected for two Rugby League tours of Australia. Hi Wes, I’m family…. I’ve done a lot of family tree research on the entire Hall clan, and bumped into a few via this page to get more info from. I’m sure if you email me we can exchange info.